I know, it's May and I'm posting a soup recipe. But it's still a bit chilly here in the Northeast, especially at night. And even though this is a soup recipe, it's a very springy recipe - light, healthy and full of lemon and herbs. 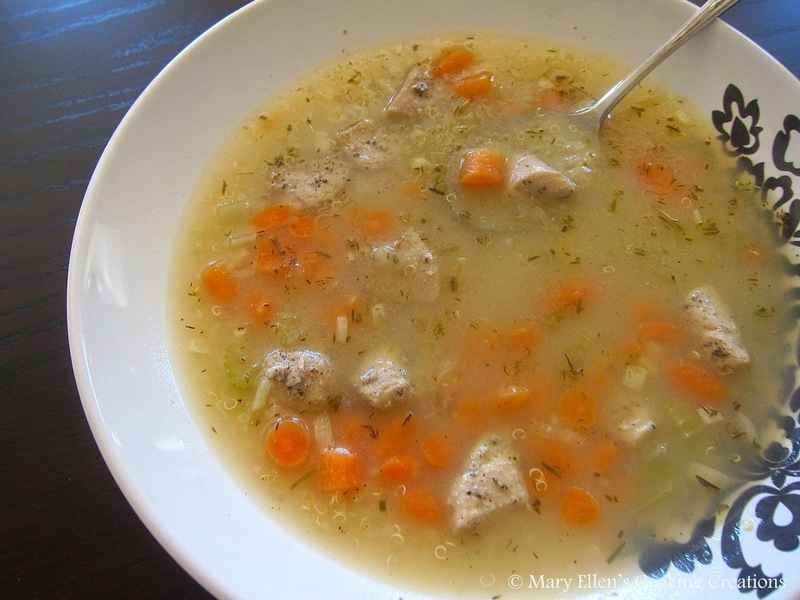 I was inspired by two things - a package of chicken I defrosted to cook that night as well as a recipe I first saw on Pinterest for a Lemon Chicken Orzo Soup. The link took me to the blog Damn Delicious and my mouth was watering after looking at the amazing pics. I read through the recipe and decided to use it as inspiration. Below is my adaptation of the recipe using quinoa instead of orzo, as well as several other changes to make this a light and healthy soup. Heat the remaining oil in the pot and add the garlic, onion, celery, and carrots; sauté 3-4 minutes until tender. Add the chicken broth and quinoa. Bring to a boil and then cover and let simmer until the quinoa has cooked through, about 10-12 minutes. Return the chicken to the pot and add the lemon juice. Stir.